For me these days, smelling a Serge Lutens scent for the first time is a loaded experience. When I first began to explore perfume ardently, the Serge Lutens line yielded some of my favorites — Chergui, Chêne, Douce Amere, Bois de Violette, and more — and others that expanded my appreciation for perfume in general, such as Borneo 1834, Serge Noire and Muscs Koublaï Khan. But the line kept growing. And growing. And I wasn’t finding much new to appreciate. Was it me? Last week I visited the Palais du Shiseido with the intention of smelling Baptême du feu. I felt the now familiar apprehension of someone visiting an old lover. The shop was as calm and exotic as ever, with its dark walls, vaguely Morocco-Deco feel and hushed voices. I glanced up the spiral staircase rising from the middle of the boutique, wondering if “he” were up there. A friendly saleswoman handed us mouillettes sprayed with Baptême du feu. "My emotions are fluid,” Serge says in his press materials. “Like liquid wax poured into a mould, they determine what seduces me — like this gingerbread heart." Reportedly, Baptême du feu was inspired by the carnivals and funfairs (with their shooting ranges) of Lutens' youth in Northern France. The fragrance’s notes include burnt orange peel, ginger, cinnamon, osmanthus and castoreum. In brief, Baptême du feu is a sheer gourmand fragrance loaded with baking spice and bright with tingling citrus and stemmy floral top notes. Cinnamon and sweetened ginger hit me first, but it’s more complex than any gingerbread I’ve ever eaten. For one, a green thread runs through it, diluting the fragrance’s bent toward the pastry case. For another, an almost caramelized wood grounds it. Finally, a hit of “manly cologne” — I’m not sure what else to call it — rises as Baptême du Feu settles. It's not lavender and not fougère, but it's traditionally "manly" all the same. This has the advantage of pulling Baptême du feu out of scented candle territory, but it also moves the fragrance from my own preference zone. Someone who has longed for a scent that bridges a classic Eau de Cologne and a warm gourmand fragrance, though, might find the answer to his or her prayers in this one. As I sniff Baptême du feu, I can’t help but wish I had some Five o’clock au gingembre to compare it to. Memory tells me that Baptême du feu is fresher, but I welcome the comments of anyone who has tried them side by side. Serge Lutens Baptême du feu Eau de Parfum is $150 for 50 ml. 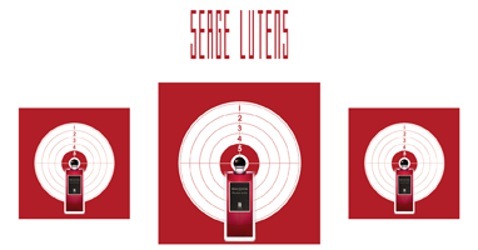 For buying information, see the listing for Serge Lutens under Perfume Houses. And there go my hopes for being intrigued by another Lutens release. I have to agree, Angela. Not only have I not been able to keep up with the prolific number of SL releases, but of those I’ve tried, none has moved me like SL scents of days past. And I’m not even going to try his more upscale range for fear I may actually fall for one while knowing it’s nowhere near my budget these days. Still keeping my fingers crossed, though, while generously spraying on Daim Blond and dreaming of SLs past. You know, I have to wonder what Serge thinks, too. Does he feel the pressure to continue to release perfumes, or does he truly feel inspired each time he releases one? I bet there’s pressure to keep them coming, to keep those bumps in fragrance sales. I wonder what would happen if he slowed down releases, though? At least he doesn’t discontinue hordes of them like Tom Ford does. I’d be very curious to know the extent to which Serge himself is still involved at this point. Not that there’s any particular reason to think he’s stepped back, but Uncle Serge is 74, and he did sell off the brand to Shiseido last year. Hmmm…..very good point! There’s so much behind the scenes stuff we don’t know. At least he hasn’t–or Shiseido hasn’t–turned out a La Vie est Belle clone. For me the beginning of the end was 2009, with his boring and derivative L’Eau. As far as I’m concerned he’s had only one real winner since then, Jeux de Peau, and a couple of good but already-done scents, Fille de Berlin (we didn’t REALLY need another rose from him, though I do like it) and Santal Majuscule (a mix of Jeux de Peau and Santal Blanc). I haven’t tried Baptême de Feu but it sounds like a retread of Five O’Clock with some minor tinkering. I honestly think he’s out of ideas. He must be under some pressure to keep up a steady schedule of releases. That’s all I can think. He also has the problem of having a terrific backlist to live up to. I am wearing Bapteme de feu today and I am quite entranced. As a side by side 5oclock seems very linear and soft. I’m glad you love it! I’d think you’d enjoy it even more as the weather cools. Thanks, too, for the comparison to 5 o’clock. I find many of Serge Lutens scents to be a little too masculine for me. I am disappointed that Bdf is another Lutens that leans to the masculine. Although, I may still test it out of curiosity. Thanks for the review Angela. I hope you’re having fun! I like Eaux de Cologne and am wary of gourmands, so maybe I am that person looking for a perfume to bridge that gap, not that I’d ever thought of it in those terms before. So I’ll keep an eye out for this one although the only outlet near me has a limited range of SLs and sticks to the good ol’ days of Serge’s early work. It seldom gets the new releases, and perhaps this in itself is telling. The market in this city for niche perfume would be small and this seller must believe that its customers don’t have much appetite for a confusion of new releases. Please let us know what you think of it if you get the chance to sample it! It’s gourmand, but more in a spicy, rather than vanilla, way, if that helps. I got a sample of this but was underwhelmed. It was sheer, not long lasting and rather indistinctly sweet. It’s a pass for me. Money saved. Thanks for weighing in on it! I’ll be passing, too. The last SL I loved was 2004 Daim Blond. Well, maybe 2005 Borneo, too, but I liked the similar PG Coze better. I thought 2011 Vitriol d’Oeillet was genuinely original and interesting enough to obtain a highly discounted partial bottle. Of course, I haven’t tried most of the recent super-expensive ones, but wasn’t taken with the few that I did. What I really wonder is whether the current versions of the classics are any good, especially La Myrrhe, Bois de Violette, and Iris Silver Mist. I feel like I’ve heard that ISM is not so great anymore. Did you try any of those, by any chance? I loved both Daim Blond and Borneo, too, and I agree about Vitriol. I haven’t tried La Myrrhe lately (I love the decant I have, though!) or the others. You raise a good question. I haven’t heard anyone complain about them, although it sounds like you have. I’ve only worn it once so far. I didn’t find Baptême de Feu to be similar to Five O’Clock au Gingembre at all. I don’t see any such notes in any breakdowns, but I found it called more to mind the aniseed of Douce Amère or the licorice of Jeux de Peau, at least in the drydown. Thanks for passing that along! I wished I had a sample of Five o’clock to compare, so it’s great to get your impression. I tried it at the department store and wasn’t moved (or maybe my nose was just too tired from all that sniffing), but your description is lovely and I’ll certainly check it out once more! I also think it’s something my SO would love — nice and spicy, but not too sweet. It’s so hard to sample something new when it’s one of ten things you’re sampling! I hope it’s a good one for your SO. My line seems never to shorten, so I know the feeling!